Offering you a complete choice of products which include Respiratory Products Range.... such as TULCOF-PLUS Syrup is a 100% Herbal Cough Syrup, Respirid Syrup, Herbal Cough Syrup, Herbal Ayurvedic Pain Relieving Balm - Panesia Rubefacient, Herbal Anti Asthmatic Respirid Capsule, Smokers & Tobacco Chewers Dry Cough Remedy Tulcof Capsules and many more items. With the customer focused approach and vast industrial experience, we are providing a wide array of Herbal Cough Syrup as required by our valued clients. This syrup is alcohol free which offer no drowsiness while taking it. In addition to this, these are processed using best quality ingredients at a well-equipped production unit under the direction of experts. Cough, Cold , Congestion, Acute and chronic bronchitis, allergic cough, Laryngitis, Pharyngitis & as a chief adjuvant in dealing with pulmonary affections. Reduces mucosal inflammation, relieves chest congestion, Pyrexia, and body aches. Checks out excessive mucous secretion, as a digestive, decongestant and diuretic. diabetic patients and even for children. Tulcof Syrup : Infants & Children: ½ to 1 teaspoonful of Tulcof 3 to 4 times a day. Adults: 1 to 2 teaspoonful 3 to 4 times a day or as directed by the physician. Tulcof Syrup : 100 ml pet bottle with attractive outer carton box. Packaging Details: Tulcof Syrup : 100 ml pet bottle with attractive outer carton box. In order to satisfy the variegated demands of our valuable clients, we are offering them a perfect range of TULCOF-PLUS Syrup is a 100% Herbal Cough Syrup. These are formulated as per the industry parameters using pure quality ingredients and latest technology and helps in the treatment of Cough, Cold, and Asthma. Additionally, these are offered to the clients at very reasonable rates within the committed period of time. Tulsi Panchang (Ocimum sanctum) (A.B.) 100 mg.
Vasaka Panchang (Adhatoda vasica) (A.B.) 100 mg.
Yashtimadhu Roots (Glycyrrhiza glabra) (A.B.) 50 mg.
Sunth Rhizomes (Zingiber officinale) (A.B.) 50 mg.
Marich Fruits (Piper nigrum) (A.B.) 50 mg.
Banaphasha Flowers (Viola odorata) (Bh.P.) 50 mg.
Lavang Fruits (Caryophyllus aromaticus) (A.B.) 50 mg.
Taj Bark (Cinnamomum zeylanicum) (A.B.) 50 mg.
Pippali Spikes (Piper longum) (A.B.) 50 mg.
Haldi Rhizomes (Curcuma longa) (A.B.) 50 mg.
Kantakarika Panchang (Solanum xanthocarpum) (A.B.) 50 mg.
Jayphal Seeds (Myristica fragrans) (A.B.) 30 mg.
one teaspoon three times a day or as directed by the physician. 100 ml pet bottle with attractive outer carton box. With our expertise in providing products for medical and research laboratories, we are specializing in supplying a variety of Respirid Syrup to our customers. Offered products are formulated in strict compliance with the industry defined guidelines. In addition, these products are widely demanded across the market for their optimum result, non-toxicity and accurate composition. Peppermint Sat (Mentha piperita) (A.P.I.) 5 mg.
Vasaka Panchang (Adhatoda vasica) (A.B.) 500 mg.
Antamul Panchang (Tylophora asthmatica) (A.B.) 500 mg.
Haldi Rhizomes (Curcuma longa) (A.B.) 100 mg.
Sunth Rhizomes (Zingiber officinale) (A.B.) 100 mg.
Pippali Spikes (Piper longum) (A.B.) 100 mg.
Bharangi Roots (Clerodendrum serratum) (A.B.) 100 mg.
A Powerful anti-phlegmatic, analgesic, anti-inflammatory, anti cold and rubefacient. Exerts exothermic action on pains & colds, joint pains chest-affection and congestions. Prompt relief & sustained results. Widely used in place of ANTI- PHLOGISTON. Specially prepared in petrolatum base, make the action prolonged. When inhaled its steam (after mixing into a cup of hot water), the vapors arrests profuse secretion and relieves congestion of the bronchioles and bronchitis. Spontaneous relief from headache, stiff-joint pains, muscular pains, stiff-neck, and spasms, muscles cramps, cough and cold effects, inflammation, sprains, and helps regulate circulation, if massaged on the effected parts. Colds, cough, congestions, aches, and pains, stiff-neck, sprains. And gives warmth as a fomentation, and helps to dissolve clotting. For external application on affected parts, 2 to 3 time a day or as directed by the physician. A powerful ANTI-PHLOGISTON. 15 gm Lammi Tube with Carton. Packaging Details: 15 gm Lammi Tube with Carton. Asthma (AZ-ma) is a chronic (long-term) lung disease that inflames and narrows the airways. Asthma causes recurring periods of wheezing (a whistling sound when you breathe), chest tightness, shortness of breath, and coughing. The coughing often occurs at night or early in the morning. Asthma affects people of all ages, but it most often starts in childhood. In the United States, more than 22 million people are known to have asthma. Nearly 6 million of these people are children. The airways are tubes that carry air into and out of your lungs. People who have asthma have inflamed airways. This makes the airways swollen and very sensitive. They tend to react strongly to certain substances that are breathed in. When the airways react, the muscles around them tighten. This causes the airways to narrow, and less air flows to your lungs. The swelling also can worsen, making the airways even narrower. Cells in the airways may make more mucus than normal. Mucus is a sticky, thick liquid that can further narrow your airways. This chain reaction can result in asthma symptoms. Symptoms can happen each time the airways are irritated. The symptoms of asthma vary from person to person and in any individual from time to time. It is important to remember that many of these symptoms can be subtle and similar to those seen in other conditions. 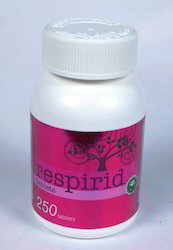 RESPIRID relaxes bronchial muscles & Prevents asthmatic attack. RESPIRID clears congestion, ensures easy breathing, reduces viscosity of secretions. RESPIRID ensures effective expectoration and no drowsiness or sedation. Asthmatic cough, whooping or dry cough, smokers recurring cough, chest congestion, cough due to tuberculosis. 1 to 2 Capsules 2 to 3 times a day for adults, or as directed by the Physician. A Box containing 10 Blister packs each of 10 Capsules. With Demulcent, anti-tussive, soothing and bronchial anti-septic properties, provides early symptomatic relief from productive and unproductive cough. Tulcof is a well balanced combination of time-tested herbs, for cough of various origin, and very effective on cough producing elements. Tulcof a non- alcoholic preparation, does not contain , or its derivatives. Hence, safe for infants, and certain constitutions who are allergic to strong synthetic treatment and drugs such as cardiac and hypertensive patients. Equally beneficial and safe for pediatric to Geriatrics. Cough, Cold , Congestion, Acute and chronic bronchitis, allergic cough, Laryngitis, Pharyngitis & as a chief adjuvant in dealing with pulmonary affections. Reduces mucosal inflammation, relieves chest congestion, Pyrexia, and body aches. Checks out excessive mucous secretion, as a digestive, decongestat and diuretic. diabetic patients and even for children. TULCOF Capsules : CHILDREN: 1 Capsule 2 to 3 times a day or as directed by the physician. ADULT:2 Capsule 2 to 3 times a day, or as directed by the physician. TULCOF Capsules : A box pack of 10 blister strips and each of 10 capsules of TULCOF. A plastic jar pack of 250 Capsules of TULCOF. Packaging Details: A box pack of 10 blister strips and each of 10 capsules of TULCOF. With the help of our expertise, we are engaged in offering premium quality TULCOF-PLUS Syrup to our valuable clients. These products are formulated using high grade natural ingredients and advance formulation techniques. Our offered products are duly tested against various parameters before delivery in compliance with medical industry norms and highly acclaimed by our clients for its effectiveness. In addition to this, these products are available in varied specifications as per exact requirements of clients in the most effective manner. 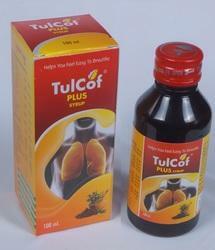 TULCOF-PLUS Syrup is a 100% herbal cough syrup, that helps in treatment of Cough, Cold and Asthma. It is alcohol free, so no drowsiness while taking it. Vasaka Panchang (Adhatoda vasica) : Extensively used for treating cold, cough, whooping cough, chronic bronchitis and asthma. It acts as a , expectorant, antispasmodic and anthelmintic. It is a bronchial antiseptic, bronchodilator and expectorant. Yashtimadhu Roots (Glycyrrhiza glabra): Useful in sore throat, chronic cough, for the treatment of asthma, acute and chronic bronchitis. Banaphasha Flowers (Viola odorata) : Expectoran. Haldi Rhizomes (Curcuma longa) : Cough, Cold, Stuffy Nose, Chest congestion, sore throat and cough bronchitis. 1 to 2 Tablet 2 to 3 times a day for adults, or as per the advice of the Physician. Pippali Spikes (Piper longum) (A.B.) 50mg. Tulsi Panchang (Ocimum sanctum) (A.B.) 50mg. Yashtimadhu Roots (Glycyrrhiza glabra) (A.B.) 50mg. Vasaka Leaves (Adhatoda vasica) (A.B.) 50mg. Sunth Rhizomes (Zingiber officinale) (A.B.) 25mg. Khurasani Ajawayan Seeds (Hyoscyamus niger) (A.B.) 20mg. Rasna Roots (Pluchea lanceolata) (A.B.) 10mg. Packaging Details: A plastic jar pack of 250 Capsules of TULCOF. Banking on the skills of well-qualified and talented professionals, we are presenting a high-quality range of Ayurvedic Cough Syrup to the clients. The offered products are used in cough and cold. Keeping in mind the assorted needs and demands of the customers, we are also offering these products in various packaging options at very reasonable rates. 1. 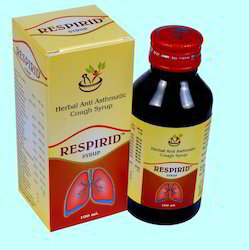 RESPIRID Capsules/Syrup/Tablets Asthmatic Cough, Whooping or Dry Cough, Smokers Recurring Cough, Chest Congestion, Cough due to Tuberculosis. 2. TULCOF Syrup/Capsules Herbal Cough Remedy with TULSI, Acute Common Cold, Sinusitis, Rhinitis, Nasal Congestion. 3. 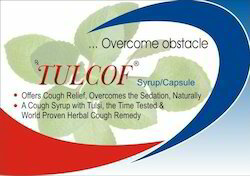 TULCOF-PLUS Syrup A 100% herbal cough syrup, that helps in treatment of Cough, Cold. It is alcohol free, so no drowsiness while taking it. 4. PANESIA Rubefacient Muscular-aches, Muscle & Body pain/Headache associated with Common-cold. 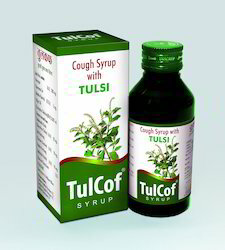 Indications : TULCOF-PLUS Syrup is a 100% herbal cough syrup, that helps in treatment of Cough, Cold and Asthma. It is alcohol free, so no drowsiness while taking it.